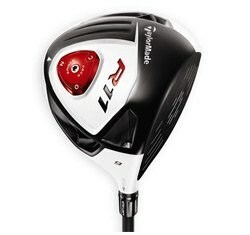 There's no doubt that this driver was the best new product of 2011. I see these Oreo cookie-looking things all over the place. They're on the Tours and all over the muni's that I play. Maybe it's just that I notice them more because they stand out so much. The first time I had the opportunity to hit one, I was on my favorite driving range in Florida and I noticed a crowd of six guys standing around a man ripping drives to the back of the range. Most of his shots had a penetrating ball flight that started out right and drew back to the left. Then one of the guys said, "Can you hit some fades?" Sure enough, he started hitting high-booming fades that hung in the air like a balloon. I stepped up and asked him if I could hit a couple. The driver has always looked ugly to me with the vanilla ice cream crown and the coal black face, but one thing for sure with that contrast, I can easily tell at address if I'm lining it up square. It was evening, so I couldn't tell if the anti-glare white paint performed as advertised. I can tell you, however, that it felt very light probably because it has a 440cc clubhead. This is smaller than I expected. My first shot I hit dead straight. The ball shot of the face like a bullet, flew high, and landed rolling hard. I asked the gentleman if the club had been adjusted, because it has several different face setting from open to closed. He said it was set to neutral. I hit a couple draws and then handed it back to him. I can see why the club is popular. It is very easy to swing and work the ball, and the color scheme is growing on me.